A tumultuous hour and 23 minutes after the start of the Korea Open Superseries women’s singles final that saw fortunes fluctuate wildly in both directions, a physically and mentally exhausted PV Sindhu swung her neck to the left and, with sweat-blurred eyes, watched a crosscourt clear from her Japanese rival Nozomi Okuhara, float gently out along her backhand sideline. The 22-20, 11-21, 21-18 scoreline secured Sindhu's third Superseries title in the course of the past year, behind the 2016 China Open and 2017 India Open; and made her richer by US$45,000. When one considers the seven-figure sums that are dished out to winners of Grand Slam major tennis tournaments, the women’s singles top prize in the $600,000 prize money competition was a mere pittance. Of course, the off-court rewards by way of product endorsement contracts will narrow the gap, to some extent. This was Sindhu’s fourth victory over Okuhara in eight career meetings. Three of those four victories have come in the last 13 months, starting with her 21-19, 21-10 pummeling of the pocket-sized Japanese at the semi-final stage of the 2016 Rio Olympics, although the Indian failed to go all the way in the quadrennial event. Sindhu went on to notch the narrowest of wins over Okuhara in the Singapore Open Superseries in April this year, the score reading 10-21, 21-15, 22-20. And then, there was absolutely nothing to separate the two gladiators at the World Championships last month. Until the very last point of their 110-minute epic, it was impossible to predict the winner as both played themselves to a standstill. Okuhara’s 21-19, 20-22, 22-20 triumph, that gave her the gold medal in Glasgow, could well have left Sindhu shattered since so much rode on the result of that joust. If the points that each player won during that titanic struggle were counted, it could be ascertained that the Japanese player won 63 points to Sindhu’s 61 in a battle that has gone down in the annals of the game as an all-time classic. Ironically, at Seoul’s SK Handball Stadium on Sunday, Okuhara actually won more points than Sindhu – 59 points, to the Indian’s tally of 54 – but ended up on the second step of the victory rostrum, while her rival towered over her on the top step. The crux of the matter was that Sindhu won the points that counted, and that mattered in the final result. Although the Korea Open final did go the full distance, and once again reduced both players to a state of utter exhaustion, it must be said that the duel failed to attain the dizzy heights of their World Championship title battle, except for a brief period in the closing reaches of the decider. Both girls appeared tense, and not quite on top of their ‘A’ game. There were far more unforced errors from both rackets than there had been in their Glasgow encounter. Rallies were long, but they were not as probing as they had been three weeks ago, when the two antagonists had put every single nook and cranny of the court to optimal use. 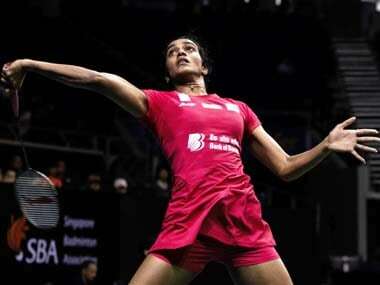 Sindhu had not been in peak form right through this tournament. She did have an impressive opener against Hong Kong’s Cheung Ngan Yi, but then had to struggle against Thailand’s Nitchaon Jindapol, and was stretched to three games in both the quarter-final against Japan’s Minatsu Mitani and the semi-final against China’s He Bingjiao. Okuhara had been much more confident and at ease throughout the tournament, and had made the final after notching facile straight-games victories over China’s Beiwen Zhang and fellow-Japanese Sayaka Sato in her first two rounds, then Hong Kong’s Yip Pui Yin in the quarter-finals, and over another compatriot, Akane Yamaguchi, in her penultimate outing. The opening stanza was tightly contested, with neither player able to break away. Sindhu was unable to play her best attacking game, and instead was reduced to playing long rallies which suited the supremely fit Japanese player very well. Okuhara reached game-point first, at 20-18, but Sindhu produced her best badminton at this stage to win four points in an unbroken reel. The capture of the first game proved all-important for Sindhu, as she was totally eclipsed in the second, and could otherwise have lost the match in straight games. A spate of errors from the Indian’s racket, coupled with some delectable deceptive overhead drops and excellent netplay from Okuhara gave the world champion the game with a start-to-finish lead. Sindhu attacked more from the start of the decider, and, after 4-all, piled on the pressure with some powerful smashes and follow-up moves to the net, to change courts with a handy 11-5 lead. Playing thereafter with great patience and concentration, and staying with her rival in the energy-sapping rallies, the Indian clung on to the lead for the rest of the match. The closest that Okuhara came was 13-15, but Sindhu was obdurate in her decision to breast the tape first. Those who had witnessed the 73-stroke rally that had given Sindhu the second game in their World Championship final were treated to a 56-stroke rally that Sindhu won when Okuhara netted a return, and which took her to 19-16. Sheer exhaustion forced the Indian on her back as she gasped desperately in an effort to get some air into her oxygen-starved lungs. Okuhara was no less tired, but she covered up smartly by bouncing on her side of the court and making little darting lunges as she would while indulging in shadow practice. It was a crafty ploy to further discourage her opponent, whose body language, it must be stressed, was not up to the mark. However, Sindhu’s staying powers, though severely tested, stood up to the stern examination; and she was able to close out the contest, to gain a modicum of revenge for her shattering loss in the World Championship final. It now remains to be seen if Sindhu can replicate this level of determination and resolve on Okuhara’s home territory, as the badminton circus moves to Tokyo for the Japan Open Superseries championships starting on Tuesday.